Is the HP Way still relevant today? 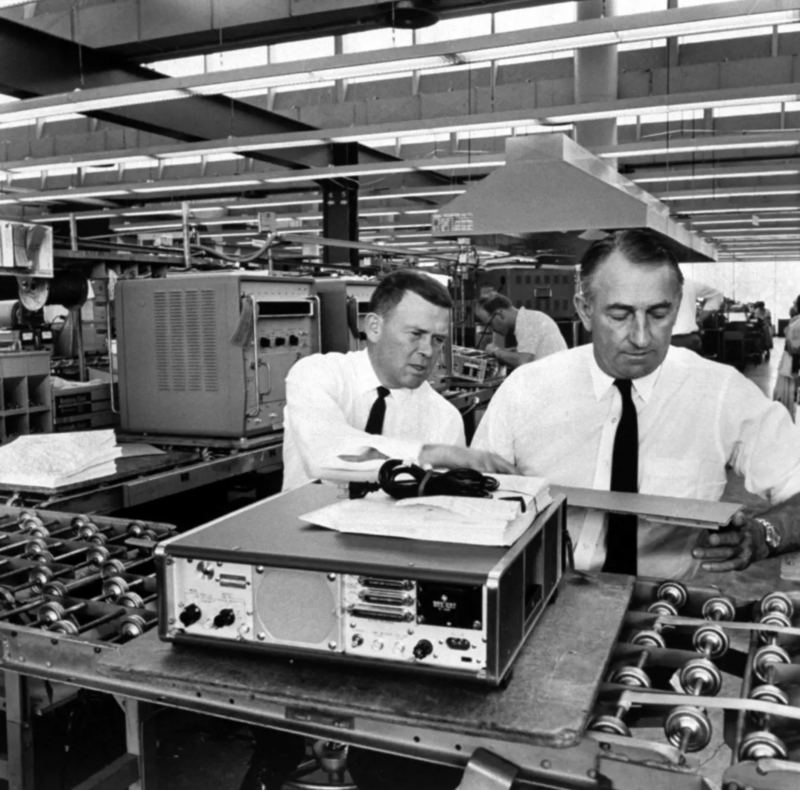 Bill Hewlett and Dave Packard at work. When many engineers are contributing code to the same application, there needs to be an agreement on how that code should be written. Ideally, when reading a codebase, the style and logical layout should feel like it was written by one person, thus making it easier to understand. This stylistic and structural consistency can be achieved by the maintainers of that codebase specifying contribution guidelines which are enforced during code review, such as the guidelines for the Atom text editor, and by use of automated tools such as linters that automatically run on each build and flag to the programmer as to whether there are stylistic inconsistencies with the proposed addition. Linters can also perform static analysis and highlight potential bugs. Defining and enforcing code consistency is an expected part of maintaining sanity during growth of an application. But what about ensuring management consistency during the growth of an organization? The leaders in an organization, through their actions, demonstrate how they expect others to act. But, with increasing size and geographic disparity, how can we guarantee that the values that the founders abide by are continued to be replicated three, five or ten levels down the org chart? Is management open to interpretation? The implementation of management, compared to the implementation of coding standards, is subject to much wider interpretation. We’re talking about human social behavior here, after all. How each manager decides to do their job is very much a function of their personality, their morals and ethics, and their interpretation of what it means to be a leader. Therefore this interpretation of the perceived management standards will be much more varied than the interpretation of coding standards. But are there management standards? A manager can find themselves without anything in particular to interpret, other than what they see going on around them combined with their own ideal that they want to work towards, which is either learned from people they’ve worked with in the past, or guided by a collective wisdom from reading around the subject, or by modeling characteristics they’ve seen in famous, successful leaders. This can work well assuming the organization is full of highly capable, self-motivated people. However, if toxic people lead an organization, this culture often cascades downwards, because other managers look to the toxic characters for an example of how they should be acting in order to progress their own careers. The current Trump administration has been described as a “Lord of the Flies” leadership style, especially so when considering the number of high profile sackings and the perceived mental instability of their leader. Trump’s leadership style has also been described as “emotional abuse”. Is it any surprise that there are so many other malignant characters drawn into the dark vortex? Is it possible to move towards a definition of how people should be managed in an organization, much in the same way that one would expect coding standards to be defined, that ensures some consistency in the actions of leaders and managers? I believe so. Consider how Shakespeare is still continually reinterpreted in new ways, even though over 400 years have passed since his death. There are classical interpretations of Shakespeare, aimed at the purist, and there are modern interpretations, such as Romeo + Juliet, McKellen’s Richard III, and the translation of The Taming of the Shrew into 10 Things I Hate About You. The adaptations are aimed to be meaningful to a different audience, whilst still delivering the essence of the original story. Without definition of values, the company evolves organically, for better or worse. Without defining how people should be treated, the canonical ethos of the founders evolves over time, much in the same way that the date assigned to Christmas, and the festivities around it, has evolved. Existing staff leave, new staff join, and the essence of how the founders wanted the original culture to be is lost in translation. With definition of values, new reinterpretations are still true to the source. Written values can be reinterpreted in different ways to suit the staff that are implementing them. Not all staff in the organization will be able to emulate the personality traits of the founders, however, they can interpret their values and bring them to life in their own unique way, in their unique location, with their unique culture. A company that is famous for the longevity of its values is Hewlett-Packard. Despite their modern presence as a predominant producer of laptops and printers, were once an incredible Silicon Valley success story. In fact, they were the Silicon Valley success story. Founded in a rented garage in Palo Alto in 1938 (yes, 1938), Bill Hewlett and Dave Packard began doing part-time electrical engineering projects. After taking an initial investment of $538, and tossing a coin to decide whether they should be called Hewlett-Packard or Packard-Hewlett, they produced their first successful product: the HP200A low-distortion audio oscillator, a new design that was over half the price and of much better quality than others on the market. Walt Disney bought eight and used them to test the sound engineering of his psychedelic masterpiece, Fantasia. From humble beginnings, over the following decades, HP grew through the semiconductor device era and began to produce electronic instruments such as oscilloscopes and calculators and continued through to computers and printers. Along this journey, the HP leadership achieved some landmark cultural implementations: establishing a health insurance plan for all employees in 1942, designing one of the first open plan offices in the same year, giving all employees with six months of service stock in the company in 1957, opening HP R&D Labs in 1966, and introducing flextime in 1973 for the wellbeing of their employees. These benefits are still seen as flagship items on job advertisements in 2018: HP had them a long time ago. 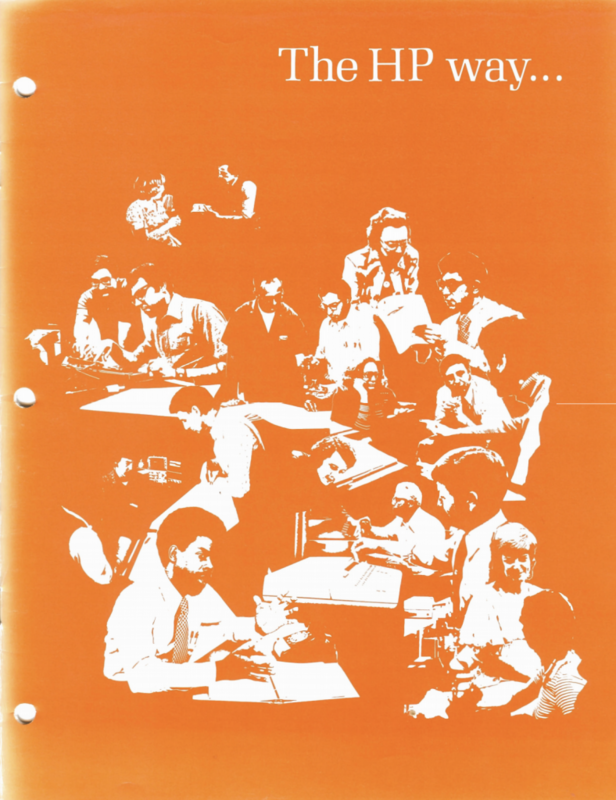 The front cover of the 1980 internal booklet describing the culture of HP. Another artifact of the culture, also a radical act at the time, was the creation and adoption of the HP Way, a working philosophy for the company. Note that a working philosophy is quite different from corporate objectives, or a vision for the future; it intends to capture the manner in which the company should operate: how employees should treat each other and how the organization should maintain these values as it grows. A scan of the paper booklet published in 1980 is a worthwhile read. It predates more recent “culture books”, which tend to be a collection of thoughts from employees about why working at a particular company is cool. It is a solid piece of thoughtful leadership work that stands the test of time. The HP Alumni website has an expansion of each of these values with additional explanation. Culturally, early to mid-stage HP must have been doing something right. Many staff spent their whole careers at the company. The HP Memory Project has lots of inspiring stories of what it was like to work there in the earlier years of the company, and it is clear that those with stories featured were incredibly proud of their job and appreciative of their colleagues. The company that I work for – Brandwatch – is much younger than HP. We’re about 11 years old. Recently the company went through the exercise of defining our own values, which were to be accountable, authentic, bold, brilliant and connected. 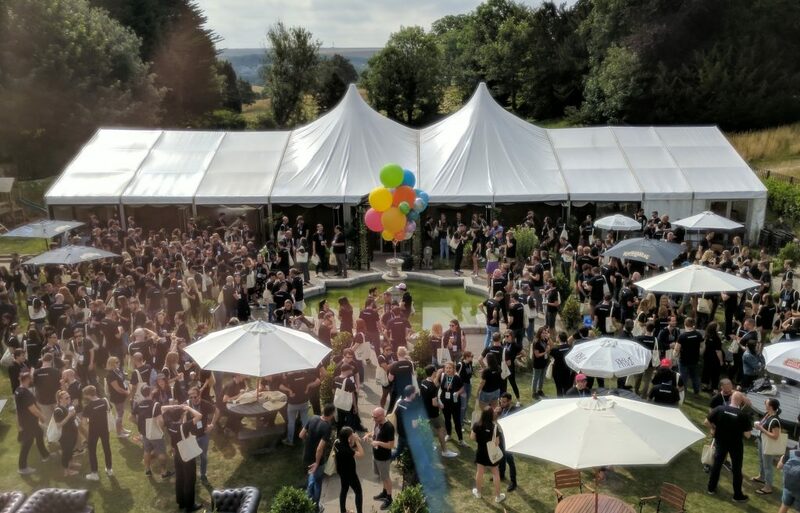 In July, the entire company came together in person for an entire day dedicated to exploring our own personal values and how they relate to those of the company. Many of our nearly 400-strong staff travelled from far reaching corners of the globe to be present, which represents a serious investment of their time and sacrifice to their commitments outside of work. Naturally, many, including myself, can approach these days with an underlying worry that people wouldn’t fully engage in the exercises, and with a skepticism stemming from whether defining company values is actually meaningful and not just another corporate exercise to enforce the status quo. However, the day itself was fantastic and put my initial hesitation to shame. Every single person that I interacted with engaged at a deep emotional level about the values that they used to orient their moral compass in their own personal lives, whether that is growth, having fun, building relationships, earning and keeping trust, or serving others. I gained some inspiring insight into people that I had only just met for the first time and had some extremely meaningful conversations. The morning was spent defining our ten most important personal values, narrowing them down to just one, and then discovering other people who were motivated in the same way. We spent the afternoon discussing in groups using the World Cafe format. Around one of the Brandwatch company values, we were asked to explore what we think it means, how we embody that behavior, how we can tell when that value is not happening, and how we can encourage more of it. Again, despite my initial, potentially British, skepticism, each group that I rotated around was truly passionate about discussing the purpose of their work, both for themselves and for the wider company. I left the day feeling uplifted and connected to those that I work with. Brandwatch staff from above. Credit to Tom Millward for the photograph. The kinds of conversation that were enabled by company values so very rarely happen in day to day work, where you are knee deep in email, or fixing a production issue, or juggling five priorities at once. The simple act of stepping away, physically and mentally, for just one day, was enlightening: a reminder that you work with humans, rather than job roles. I feel closer to all of them. So is the HP Way still relevant today? Are values still effective in uniting large groups of people from around the world? I’d say that yes, they definitely are. Why? I hear this claim from time to time, but I’ve never seen any evidence of it, either from independent research or my own experience. I’ve worked at places where functions are easily identifiable as “Alice’s code” or “Bob’s code”, and never had any trouble understanding or maintaining or extending them. In fact, it’s usually easier to get your bearings when you understand intuitively the provenance of a function. Would the programming books on your shelf be easier to read if you couldn’t tell Knuth’s code from Gries’s, or Dijkstra’s? Do we as an industry have any reason to believe that uniformity of programming style is beneficial? It sounds like one of those irrational desires that some people have for uniformity even when it’s unfounded or even counterproductive, like Steve Jobs’ wish for every employee to dress identically. I may have been guilty of an over-generalization there, so thank you for pointing it out. Your points make a lot of sense. I guess it depends on the level of style and similarity enforced. Most of our codebase looks pretty similar, but we’re not a gigantic company. The Android codebase, which I remember looking at a while ago out of curiousity, does definitely look like it was authored by many different people and has less stylistic consistency, and it’s a perfectly successful piece of software. The HP Way is still a great approach to do business. Many companies would do better having such an approach! SAP must have over 1,500 million lines of code. It’s anybody’s guess. There has to some inbred uniformity in the entire system. The culture is the premise for the system, not vice versa. That’s how I see it. Great article. Actually, wages were frozen during WW2, so that’s why US employers started offering more benefits, like health insurance plans. And open plan offices progressive, they’re the cheapest way to warehouse people.